Unknown vandals broke into the Beit Knesset Siach Yisrael in the Kiryat Yovel neighborhood of Yerushalayim Monday night, causing serious damage to the sifrei Torah and furniture. 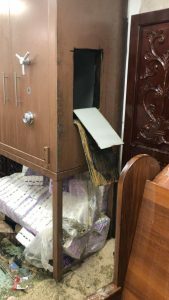 The mispallelim of the shul, a shul of the French community on Zangwill Street, were shocked Tuesday morning when they discovered that the shul had been desecrated. 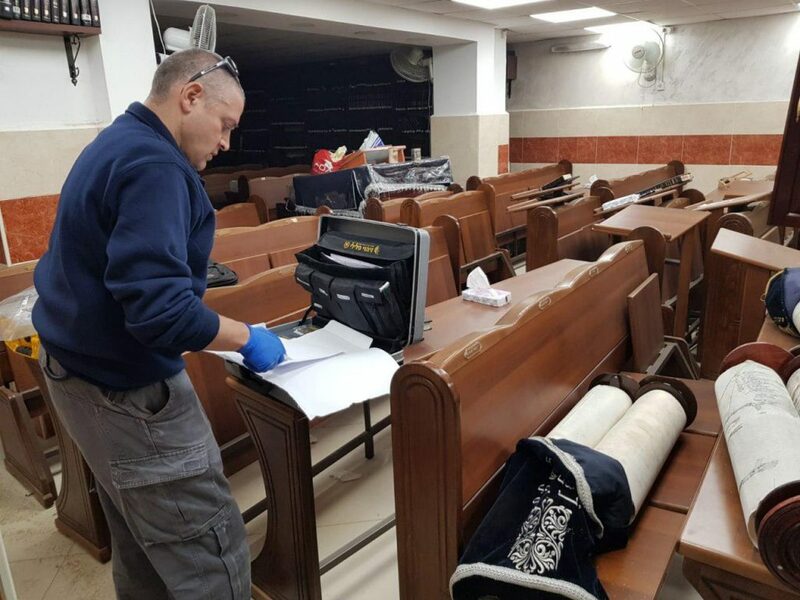 The vandals broke into the aron kodesh, removed the sifrei Torah, threw them on the floor and spilled acid on them. In addition to the sifrei Torah, numerous siddurim were damaged or destroyed. Police forces were called to the scene, and the shul was closed by forensic investigators trying to trace the rioters. The Kiryat Yovel neighborhood is an area that has seen tensions rise between some of the area’s secular residents and its growing religious community. The Rishon LeTzion ruled that “those who were exposed to the atrocity” should accept a fast or redeem it with tzedakah, and that every Jew to whom the honor of Torah is dear shall take upon himself a day of Torah study to increase and strengthen kvod haTorah. Ashkenazic Chief Rabbi Harav David Lau said, “This is a difficult morning for every Jew. “I am shocked at the desecration of a synagogue in Yerushalayim,” Prime Minister Binyamin Netanyahu said in a statement. “The police must immediately find those responsible in order to bring them to justice,” he said. Mayor Moshe Lion released a statement condemning the vandalism. 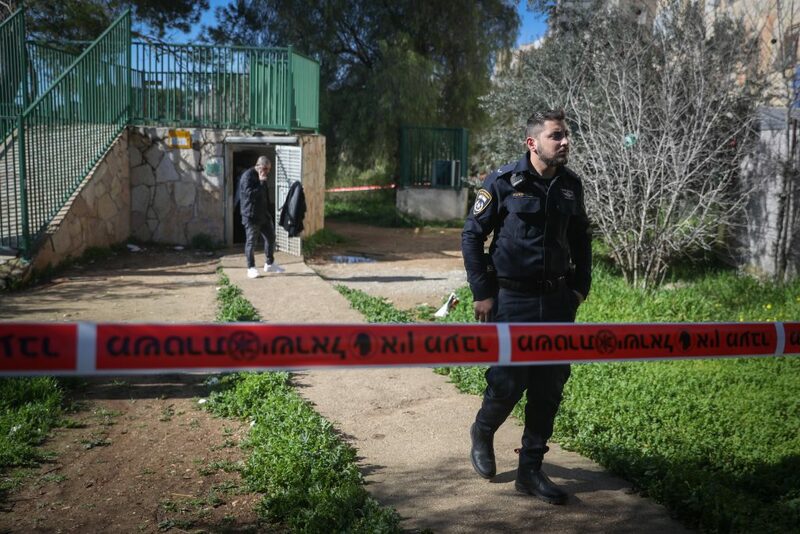 “This morning we heard the shocking news of desecration of a beit knesset and of sifrei Torah in Kiryat Yovel, a grave event reminiscent of dark periods of the Jewish people. Knesset Speaker Yuli Edelstein said that the vandalism “recalls dark days in the history of the Jewish people. “Two synagogues were vandalized this week; the first in Netanya, and the second one – in Yerushalayim, our capital… It happened here, in the Jewish State,” Edelstein said. 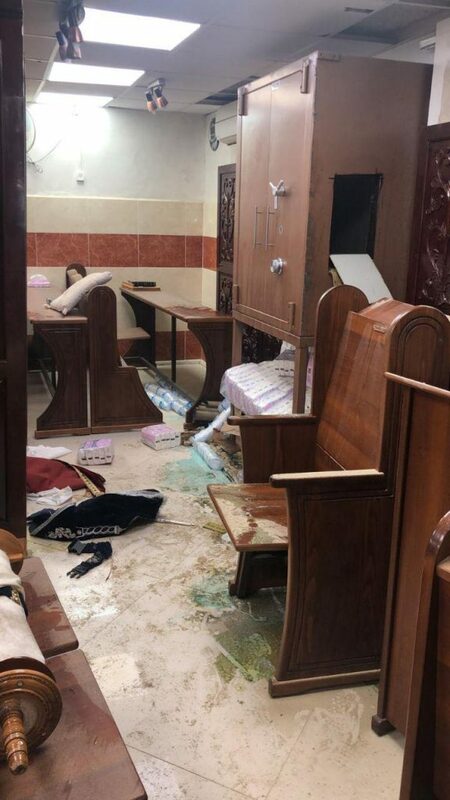 Earlier this week, vandals broke into a shul in Netanya and burned sefarim and sprayed graffiti on the walls.